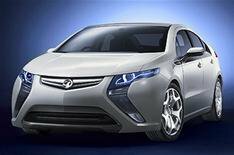 Exclusive Vauxhall Ampera preview | What Car? How do you fancy being one of the first people in the world to touch the future of motoring? Thats what youll get at our exclusive preview of the futuristic Vauxhall Ampera. What Car? is offering six readers the chance to get inside General Motors vision of the future in an event to be held in Bedfordshire on Wednesday, June 10. Youll get to poke, prod and examine the Ampera in great detail, and find out the thinking behind the whole Extended-Range Electric Vehicle concept years before it goes on sale in 2012. The preview will take place from 2-4pm, and if you would like to take part, register your interest by clicking here [readertestteam@haynet.com](mailto:readertestteam@haynet.com?subject=Vauxhall Ampera) by midnight, Sunday, May 31, including the following info: where youll be travelling from on the day, your mobile number, what car you currently drive, and a few lines on why youre interested in seeing the Ampera. If youre planning to keep using a car well into the next decade, you cant afford to miss this! Well get in touch on Tuesday, June 2 if your application has been successful, with further details of the event.